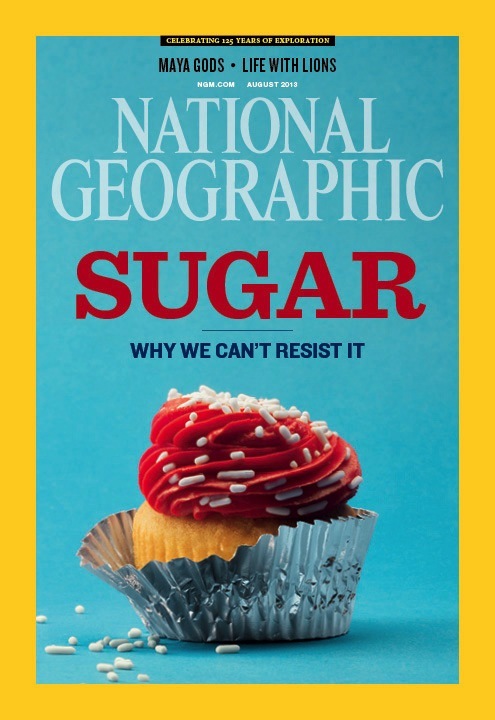 It amazes me to see sugar as the front cover topic in the August 2013 issue of National Geographic. Yet, I am thrilled to know the word is getting out about sugar. It’s the evil white powder dentists have long known about because of the havoc it raises on teeth. If we had only known how it impacts the entire body earlier. We could have warned patients earlier. We could have told them about the toe-losing affects over-sugared Type II diabetics encounter. Maybe we could have intervened prior to countless knee replacements and back surgeries for our obese patients who consumed too much sugar and gained too much weight. In my opinion, it’s time we do better. As we discover more ways sugar is laced into our food chain, we must be the health advocates for our patients–and I am not talking about dentists–solely–, but rather, all of us health care providers. We have the education, the resources, and the abilities to understand the relationship between what we eat and the ill-effects on our bodies. The story in the National Geographic is a must read if you are unfamiliar with what I am talking about. Here is the link: http://ngm.nationalgeographic.com/2013/08/sugar/cohen-text. This will not be an easy task. Oh, no. Sugar is addictive. Sugar is King in this country. Sugar is everywhere–even in things like canned vegetables. Let’s do better, first for ourselves, and ultimately for our patients.